There is little doubt today that of all operatic music, Puccini's is the most universally known; more people know the famous arias from La Boh�me, Madame Butterfly and Turandot than any others, with the single possible exception of those from Carmen – a remarkable achievement considering Puccini's early artistic struggles. Giacomo Puccini (December 22, 1858 – November 29, 1924) was a native of Lucca, born into a family which since the arrival there of a Giacomo Puccini in the 1730s had been involved in the music of the ancient town for five generations. Each generation composed and played the organ for San Martino Cathedral in Lucca. Giacomo was the fifth child of Michele and Albina Puccini, but his father died in 1864 when Giacomo was nearly five years old. Contrary to the monotonous litany of childhood musical prodigies which litter history, Giacomo showed no early interest in music, although everyone in Lucca expected him to. Instead he was a lazy, shiftless boy, poor at schoolwork and apt to play truant. His mother, however, was convinced of his abilities and procured him a tutor at the Conservatorio Musici. This time he made modest progress, becoming a choirboy at San Martino and playing the organ there from the age of 14. By his seventeenth year he had begun writing small compositions. While still 17, Puccini attended a performance of Giuseppe Verdi's Aïda in Milan; it was this experience which concentrated all his ambitions, convincing him that a career as an opera composer was the only one to consider. For the next four years he studied hard, eventually writing a pleasing Mass in 1860 (later called Messa di Gloria). Puccini spent the next three years at Milan Conservatoire, where he was taught by Antonio Bazzini and Amilcare Ponchielli, and where he undoubtedly suffered privation due to a severe lack of funds, although this is not enough to explain the extraordinary meanness with money which he showed later in life, even when he was very rich. He submitted as his "passing-out" piece the orchestral Capriccio Sinfonico, an attractive and colorful work which Puccini later cannibalized for operas, specifically Edgar and La Boh�me. Having left the Conservatoire, Puccini had to decide how to make a start in opera. An opportunity presented itself when the kindly Ponchielli drew his attention to a one-act opera prize announced by the publisher Sonzogno and arranged for a librettist by the name of Ferdinando Fontana. Puccini wrote Le Villi in such haste to meet the prize's deadline that the score was virtually unreadable, and this poor exhibit was ignored by the judges. Both Fontana and Ponchielli were convinced of its worth, however, and between them they engaged the sympathetic support of the great Verdi librettist and opera composer, Arriago Boito, as well as the enthusiastic backing of Giullo Ricordi, owner of the Ricordi publishing house. A production was mounted in Milan in May 1884, proving an enormous success, with the Corriere della Sera critic commenting: "We sincerely believe that Puccini may be the composer for whom Italy has been waiting a long time". His next opera, Edgar though again given Ricordi's enthusiastic backing, just would not come right, its poorly-executed libretto, grand opera pretensions and melodramatic plot failing to inspire Puccini, despite much hard work. Even after its initial failure in 1889, Puccini continued to revise it, determined not to waste five years of effort. But a failure Edgar has remained to this day. It is a measure of Ricordi's good judgment that he never wavered in his support for Puccini, although even he was unnerved by the composer's next choice of subject, the Abbe Prevost's novella Manon Lescaut, particularly in view of the fact that the story had been given successful operatic form by Jules Massenet in his Paris production of Manon in 1884. Puccini remained unshakeable in his choice, knowing what type of subject most suited his abilities. When it came to establishing an acceptable libretto, Puccini showed that he had learnt from his experiences with Edgar and Le Villi; this time he engaged and dismissed three librettists before finally accepting Ricordi's suggested pairing, Luigi Illica and Giuseppe Giacosa. The result was a quantum leap forward from his previous efforts. It was premiered in Turin in 1893, receiving the unanimous praise for which Puccini had waited for nearly a decade, and before the year was out it had been successfully staged in St. Petersburg, Rio de Janeiro, Buenos Aires and Munich. In one stroke the royalties enabled Puccini to repay his debts to Ricordi and begin living in his chosen village, Torre del Lago, a few miles outside Lucca, in some degree of style. The 10 years since Le Villi had seen great changes take place in Puccini's private life: his beloved mother had died in 1884 and shortly afterwards he had eloped with 24-year-old Elvira Gemignani, the wife of a local businessman. Said to have been a beauty when young, Elvira was a woman of little gaiety or humour, and the marriage did not long remain a happy one. Puccini, moreover, was a handsome man with a roving eye, and once he became famous he had endless poorly-concealed affairs. After Manon came the first opera in the group later known as the "Big Three". La Boh�me, taken from the Henri Murger novel Scenes de la vie de boh�me, was probably brought to Puccini's attention by his fellow-composer Ruggero Leoncavallo, who was working on his own version of the tale. Puccini had a penchant for working on ideas first begun by others, as if their interest in the idea proved its worth. Needless to say, it became a race to see who could complete their opera first. Puccini, in league with his librettists, Illica and Giacosa, won; their treatment was ready for the Turin premiere in February 1896, conducted by the 28-year-old Arturo Toscanini. While the public was enthusiastic, only one of the critics present found good words to say for it, the rest seeing it as showing "a deplorable decline" from the standards set by Manon Lescaut. They utterly failed to grasp its essentially different nature, rooted in lyric opera and a charming sense of the everyday. The follow-up arrived four years later, in 1900; it was based on a shocking melodrama of the so-called "realism" school of French drama, Tosca by Victorien Sardou, which had been a sensation in Paris, partly due to the presence of Sarah Bernhardt in the lead role. It was written with a minimum of problems with the libretto or the music, and was prepared meticulously for a Rome premiere, but this time the reception was not all that Puccini and Ricordi had hoped for. Few critics managed to see or hear the advances Puccini had made in the work, or its incredible dynamism, preferring to stress only the tawdriness of the tale and the lack of any redeeming moral sense. In this sense Tosca was a truly modern opera, the closest to verismo which Puccini ever came. The next subject for an opera took some time to find, even though Puccini was searching assiduously within a month of Tosca's premiere. After considering a good half-dozen ideas, in 1900 Puccini saw the London production of Madam Butterfly by the American playwright David Belasco. Although unable to understand English, Puccini was profoundly moved by its plot. Once a contract was signed with Belasco, Puccini began the work in earnest, including a painstaking search for background information on Japan and its culture. Work went smoothly until a major row developed between Puccini and Giacosa over whether the opera should be in three acts or two. In a rare theatrical misjudgment, Puccini wanted two: Giacosa three. The opening night's debacle at La Scala in 1904 was no doubt the result of an organized claque, but with only one interval, the two extra long acts were simply too much for a Milan audience unused to such demands being made on their concentration. At Brescia three months later the opera, now divided into three acts, was a stupendous success. 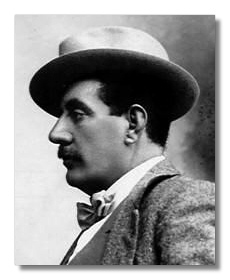 Butterfly remained Puccini's favorite of his operas, and he spent the next few years traveling to far-flung productions to ensure that his wishes were honored by the respective companies. This was one of the factors contributing to the public's wait of seven years for Puccini's next opera. Another factor was his fruitless search for operatic ideas. The subject of La Fanciulla del West (Girl of the Golden West), was only decided upon in the autumn of 1907, months after a trip with Elvira to New York where he had seen Belasco's play of the same title. There was a private reason for the hiatus, and it concerned his marriage; Puccini's propensity for affairs and Elvira's raging jealously had led to many quarrels over the years, and the relationship had now deteriorated into one of mutual exasperation. In late 1906 Elvira became convinced that Puccini had been unfaithful with their young maid, Doria Manfredi. Puccini, for once, was innocent, but Elvira began a vicious and systematic persecution of the girl, and in January 1909 Doria committed suicide. The whole village turned against Elvira while Puccini, horrified by the whole affair and disgusted with his wife, packed her off to Milan. Elvira was tried and sentenced to five months in prison. It was only after Puccini made a handsome settlement on the girl's family that the action was dropped. The rift between husband and wife took years to heal, and during the next decade Puccini embarked on a number of passionate and sustained affairs with younger women. Under these circumstances, it is hardly surprising that La Fanciulla took until August 1910 to complete, or that the new opera, premiered at New York's Metropolitan Opera House with Caruso in the cast, would be a hit-and-miss affair. Though it demonstrated a convincing advance in musical styles for Puccini, it contained a surprising lack of set-piece arias or of sympathetic characters. For once Puccini enjoyed a rapturous first-night reception from the audience, but for the first time since Edgar the welcome was not to sustain Itself over the years to come. During the following decade Puccini experienced many disappointments and partial successes. His next project, which was finally begun in 1913, was the trio of one-act operas called Il Trittico, made up of Il Tabarro, a bleak and violent piece of social realism; Suor Angelica, a delicate and lyrical tragedy with a suffering heroine; and Gianni Schicchi, a sparkling comedy. The idea for Il Trittico was one which his old publisher, Giulio Ricordi, had fought against for years, but with his death in 1912 and the accession of his son Tito (who had little time for Puccini and his vacillations) as head of the firm, Puccini followed his own muse. In 1913 Puccini was approached by two impresarios from the Theater an der Wien in Vienna to write 10 numbers for a new operetta, half of them to be sad, half gay, for which he was to be paid a fortune. The plan for La Rondine came together very rapidly, Puccini working hard on the project with his new librettist, Giuseppe Adami, but World War I intervened in 1915, putting Italy and Austria on opposite sides of the conflict. La Rondine was eventually premiered at Monte Carlo. Neither fish nor fowl, the work has never really secured a place on the world's stages, although it contains some glorious melodic moments. Meanwhile, work on Il Trittico had slowly progressed and in December 1918 the three one-act operas were premiered at the Metropolitan, New York; only Gianni Schicchi received unqualified approval. This pattern was repeated elsewhere, and although for years Puccini violently objected to the three works being parted from each other; when he finally saw a production in Lucca in 1921 he realized that its three hour duration was asking too much of the audience and stopped his objections – with the result that the first two operas virtually disappeared from public sight. In recent years, Il Tabarro at least has come to be recognized for the forward-looking masterpiece of mood and atmosphere which it undoubtedly is. Now over 60, Puccini was determined to write an opera which was on a higher plane than before and entirely different from all his others. Another long search for a subject led him to Carlo Gozzi's 1761 play, Turandotte. Once Puccini had familiarized himself with the commedia dell'arte ideas of Gozzi and the ersatz Chinese setting, he commissioned a libretto and set to work in the spring of 1920. In many letters written at this time it is clear that he felt he was putting his soul into Turandot, and the work totally absorbed him. But it was delayed by problems with the libretto and Puccini moving house to Viareggio. By March 1924 the opera was complete but the final two scenes, which Puccini, waiting for the right inspiration, shied away from completing. He was not to get the chance: a sore throat and cough which had begun to affect the lifelong smoker in the autumn of 1923 had not receded by the summer of the following year, and although doctors found nothing wrong with him, Puccini suspected the underlying seriousness of the malady. In October, the opera still not finished, he was told that he had throat cancer which was too advanced to be operable. Nevertheless, a treatment was attempted by surgeons in Brussels, but Puccini's heart was not strong enough to withstand the post-operative shock and he died on November 24. Turandot was given its premiere in April 1926; it had been completed by Franco Alfano, under Toscanini's sometimes irascible supervision. On the first night the music was stopped by the maestro at the point where Puccini's score broke off. After that, the completed version was given. It was a triumphant success, but one the composer would never enjoy.